First Birthday on the Road! 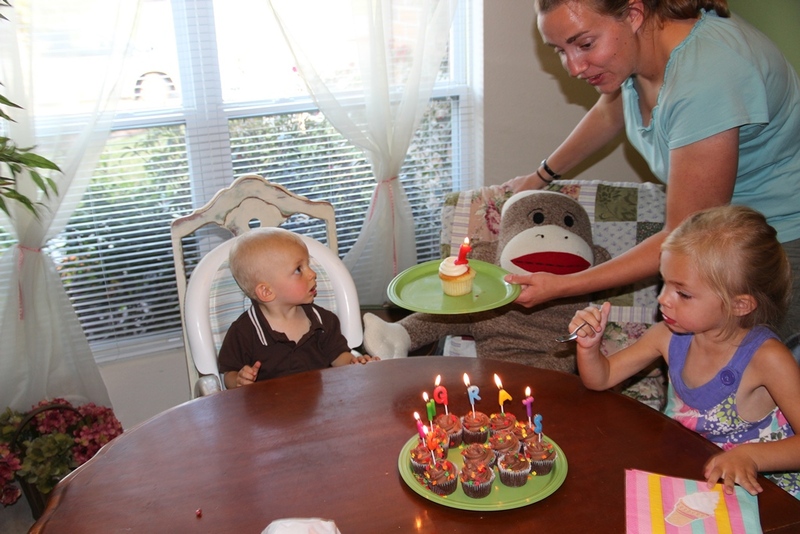 Peter had his first birthday during our stay in Houston. Despite the amazing experiences we were having as a family, I’d be lying if I said my mom guilt didn’t kick in over not being able to give him a first birthday party surrounded by grandparents and other family. 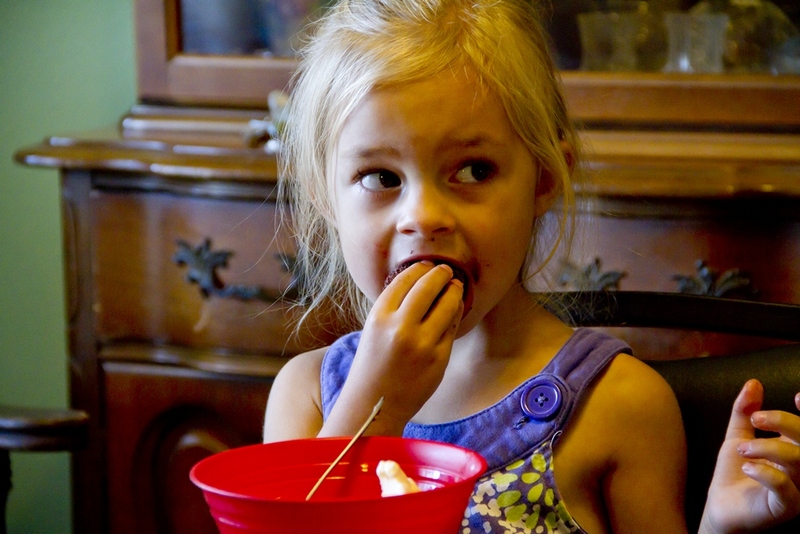 Mom guilt is a tricky, dangerous thing. Our friends really stepped up and helped us make it a fun birthday. We had cupcakes and ice cream, and of course there were presents. He seemed to have a good time, though naturally he didn’t really understand what was going on. 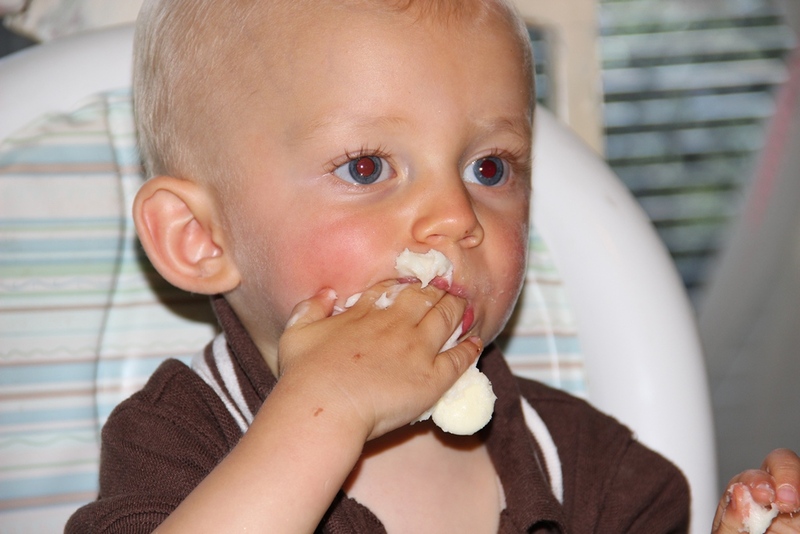 New toys, cake and ice cream, and a bit of extra attention… it’s a winning combination. 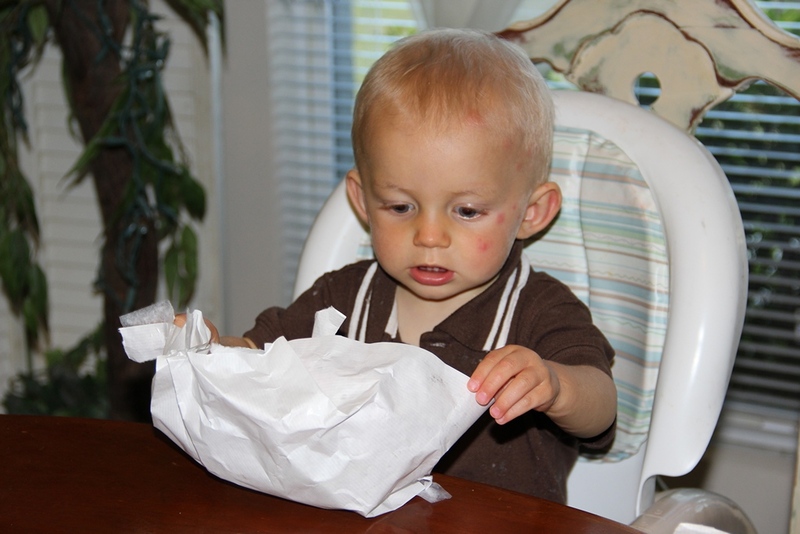 He’ll never remember it, but someday he can look back at pictures and know he was loved and celebrated. And that’s what really matters. Enjoy some pictures of the festivities! 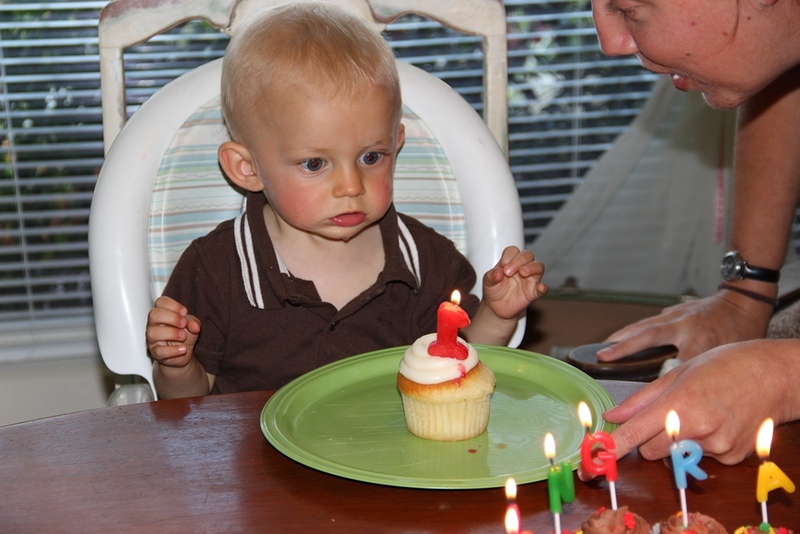 Mesmerized by the flame, clearly with no idea why his food was on fire. 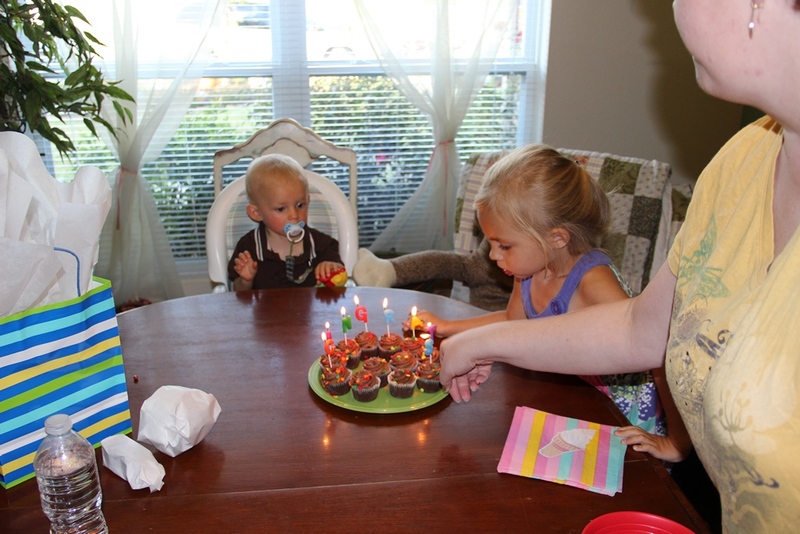 Emelie got to blow out the rest of the candles. 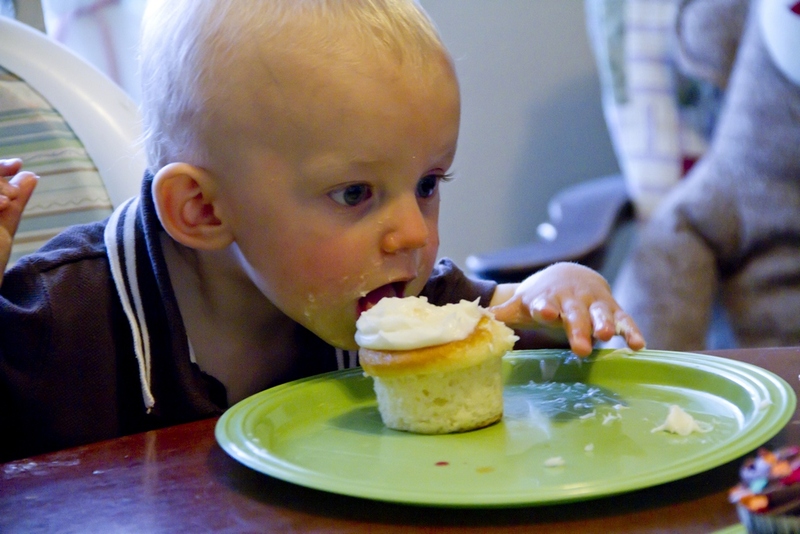 And seemed to decide that this was the best way to eat a cupcake. 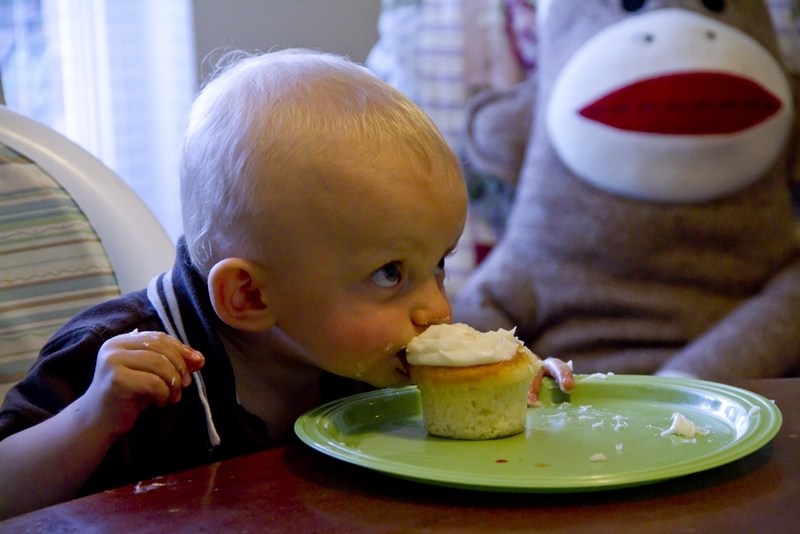 Big sister likes cupcakes too! 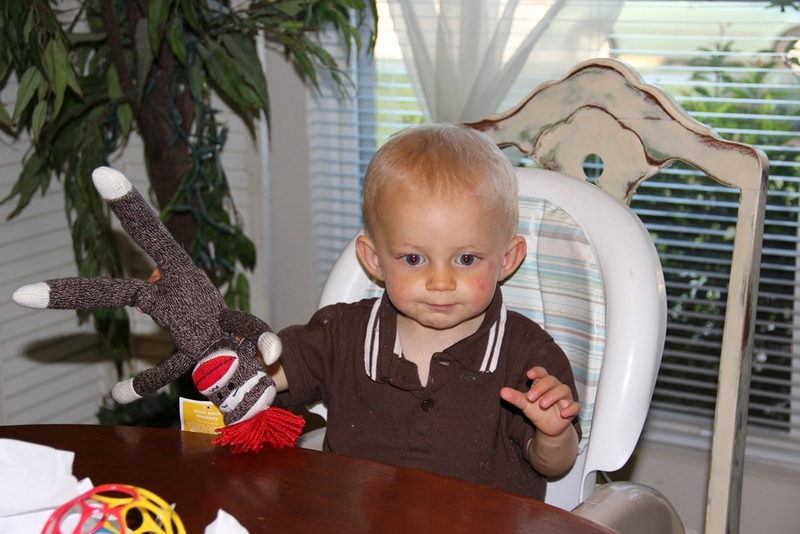 And our friends got him his own little sock monkey friend to take with him! 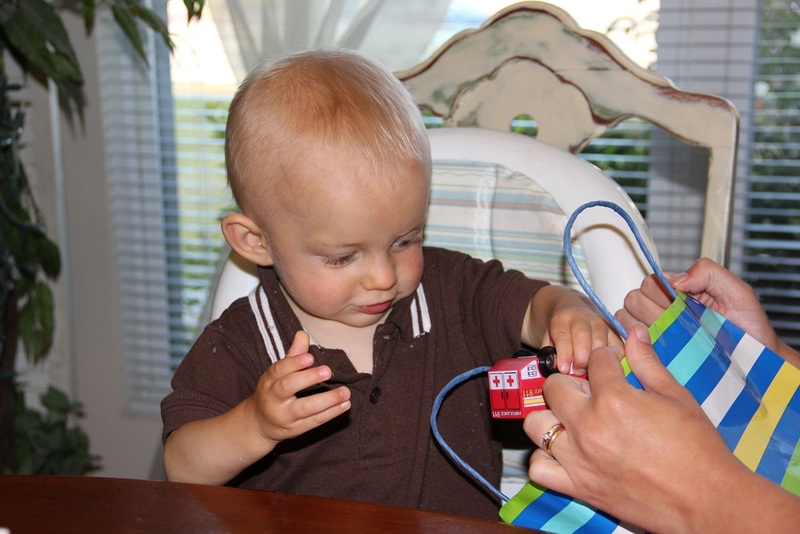 Thanks Diana, Micke, and Nancy for helping us give our little guy a special day! Once again you were a second family for us. Thanks for loving our kids so well! We have a problem. With the camper. But we already talked about that. But really, does anyone ever talk about Houston without pretending to be on a NASA mission? I guess maybe if you live there. I’ll do my best to avoid any further astronaut references. Houston was another non-negotiable stop on our route. Three good friends live there (2 of them married to each other) who used to live in Sweden. We all worked for Young Life together, and it’s the kind of work where your co-workers are the people you share life with. They become like family. 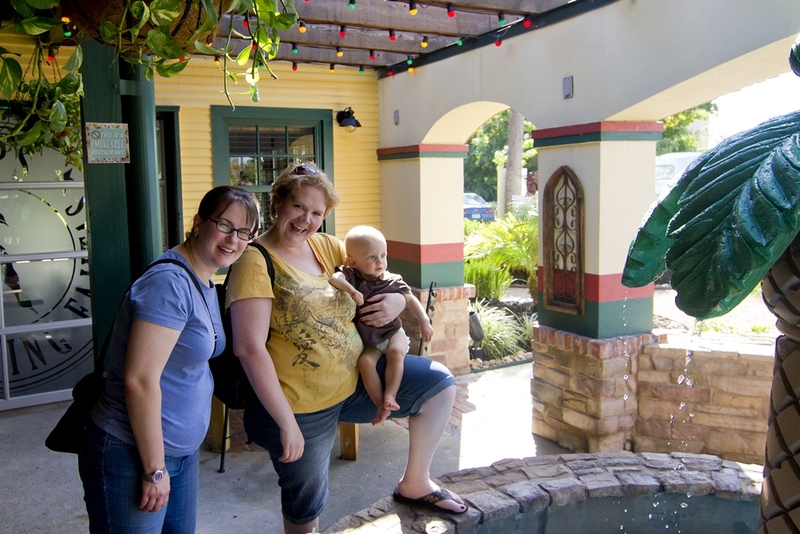 These members of the family moved back to Texas a few years ago and we missed them. It was a joy to once again be invited into their homes and to pick up right where we left off. This was another stop that was focused more on being with people than seeing a lot of sights. 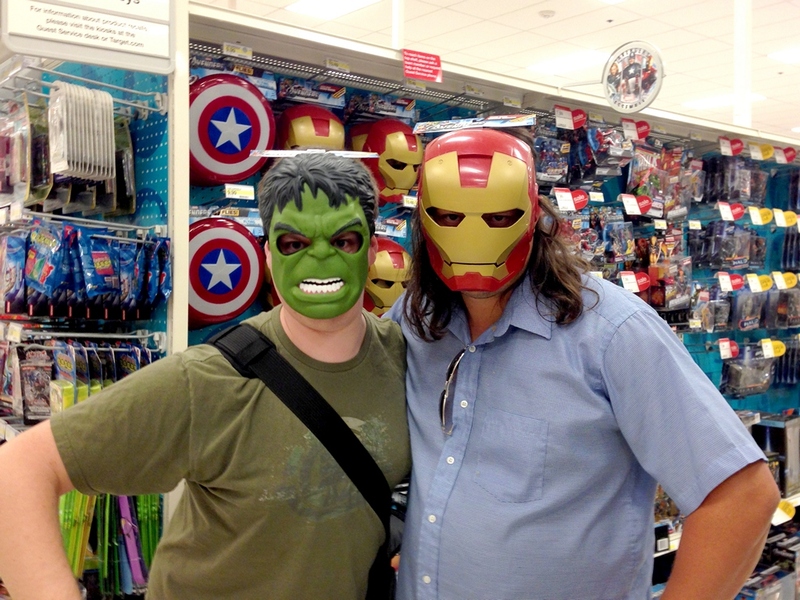 There were conversations late into the night, a trip to an amazing Tex-Mex restaurant, and silliness at Target. Wonderful days, but not too much to blog about. 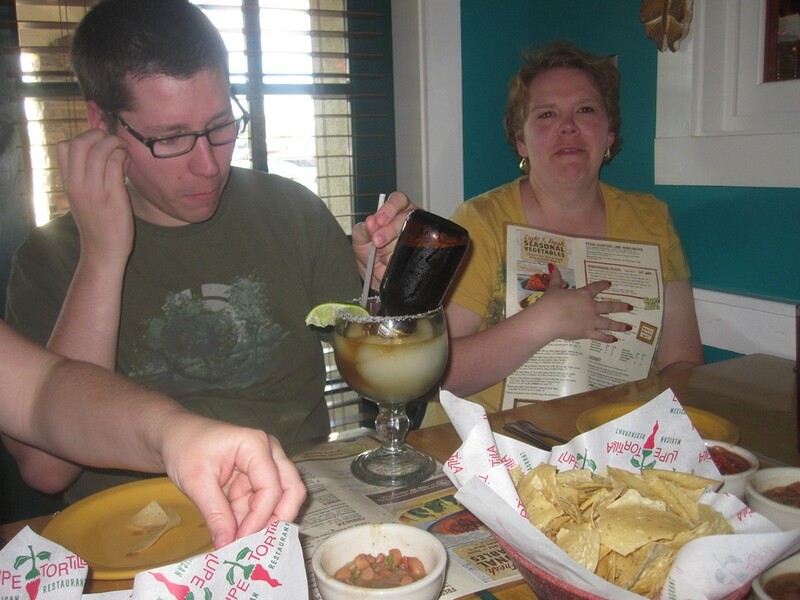 Micke ordered a truly terrifying drink… like a beer margarita? Only in Texas. 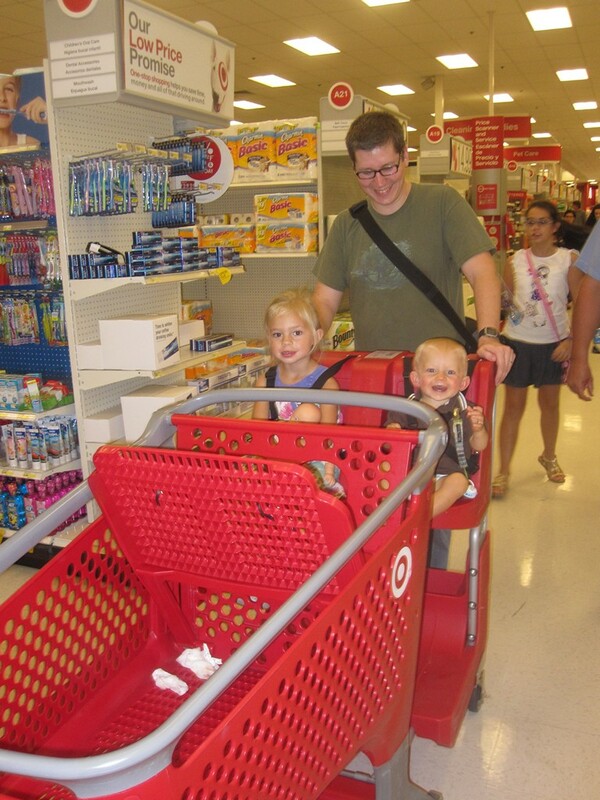 I wish our stores at home had shopping carts like this! 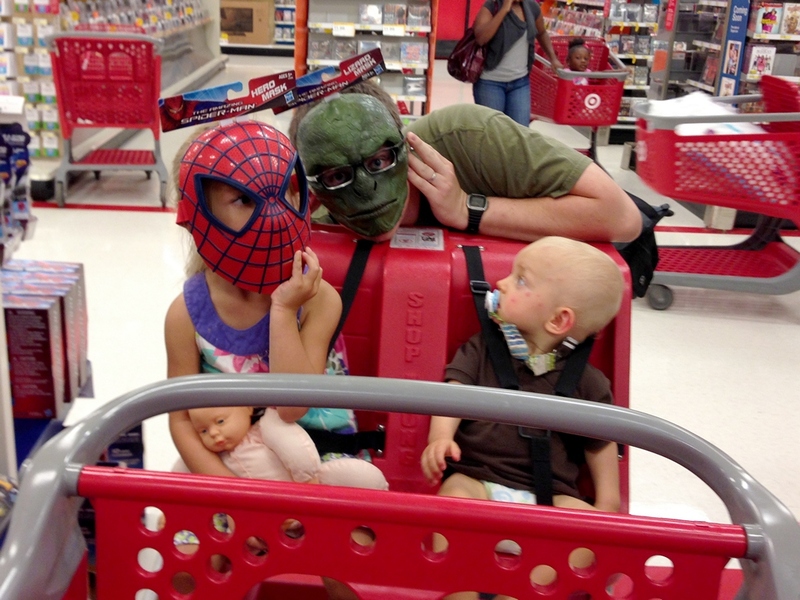 More fun in the toy aisle. Peter’s not quite sure what to make of these two. 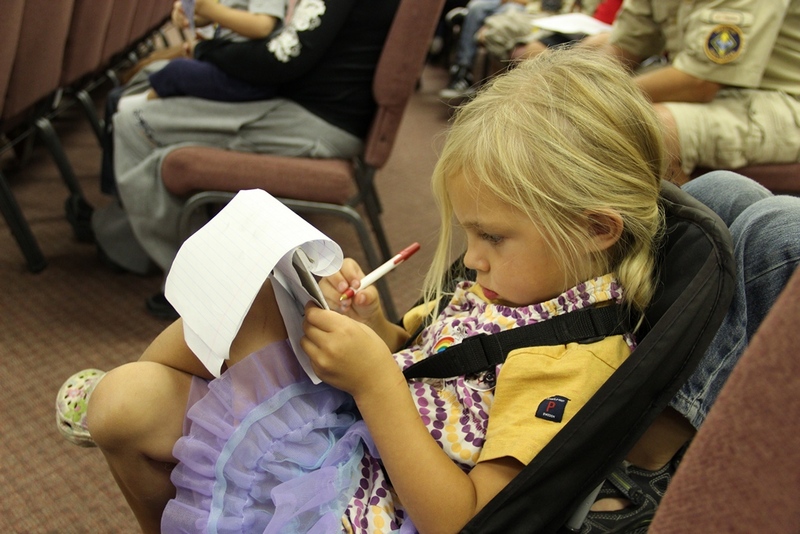 We also had the chance to go to church together at an outdoor church that focuses on outreach to the homeless community. The group worships together in a park, and afterward there are opportunities for those who need to to take clothes and other basic necessities that have been donated. They then share a meal together – not like a soup kitchen where the “haves” serve the “have nots” but rather sitting side by side and breaking bread together. It’s a beautiful ministry and it was a joy to join their community for a few hours. The congregation gathered, with bins of donated clothing & essentials on the side. Enjoying the fountain during worship. An added advantage to church in the park! Thank you to Micke for these beautiful pictures! We slept inside a house for the first time since Orange County CA, and tried to make arrangements to get the camper fixed. After calling around to a few RV places, only one called us back. The estimated cost seemed unreasonable and the wait time would make it impossible to get back to Philadelphia by Thanksgiving. We decided that the 2×2 solution had worked well enough for a few nights. We would just finish the trip without repairing the camper. Nothing like a little added adventure! The problem is I didn’t. 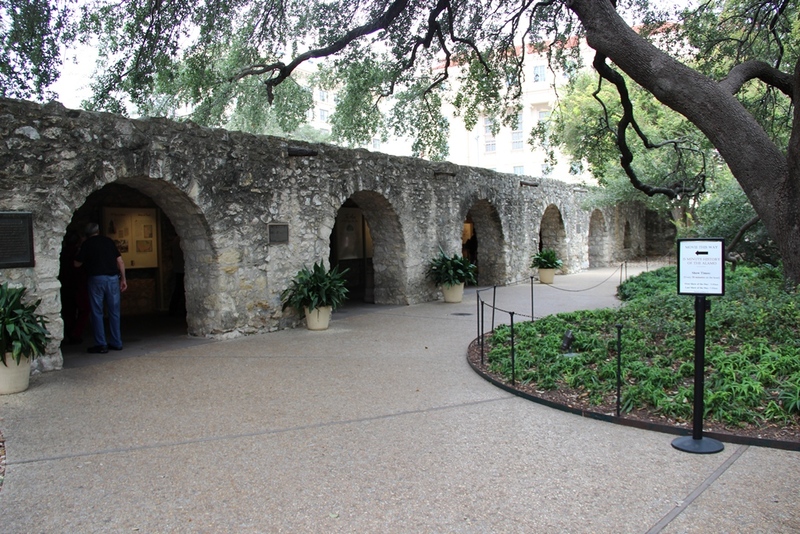 Remember the Alamo, that is. I remembered that we’re supposed to remember the Alamo, but I couldn’t remember why. As we crossed Texas, we spent a night at the San Antonio KOA and decided to spend part of the day checking out the Alamo before heading on to Houston. In between the time of our visit and when I’m actually writing this, I’ll admit that I’ve forgotten most of it again. I’ve had to “ask Mr. Google” for help with some of the details in order to be able to write a good post. 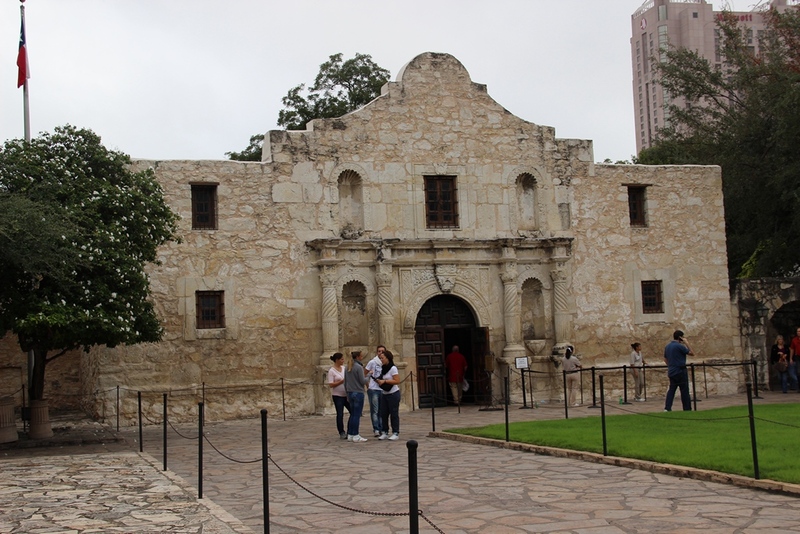 Maybe the reason they have to tell everyone to “Remember the Alamo” is because otherwise it seems to be somewhat forgettable. Or maybe it’s just me. I’ve heard that one shouldn’t mess with Texas, and I don’t want to hurt anyone’s feelings. There is certainly an appeal in the “heroic struggle against impossible odds” (as the official website thealamo.org puts it) and I can appreciate the sacrifice of people laying down their lives for something they believe in. I suppose as a non-Texan, it’s hard for me to understand the importance of a “Shrine of Texas Liberty” when Texas was independent for a relatively short time (9 years) before joining the United States, where it’s been a part of the Union for about 170 years now (thanks Mr. Google). My impressions from watching the video in the visitor center and touring the area is that it was a tragic loss of life by some passionate and potentially influential young men (including the legendary David Crockett), cause by some poor decisions, bad strategy and with perhaps just a bit of arrogance and pride added to the mix. I confess myself unimpressed by the Alamo, and I don’t know that I would recommend anyone to go out of their way to visit. 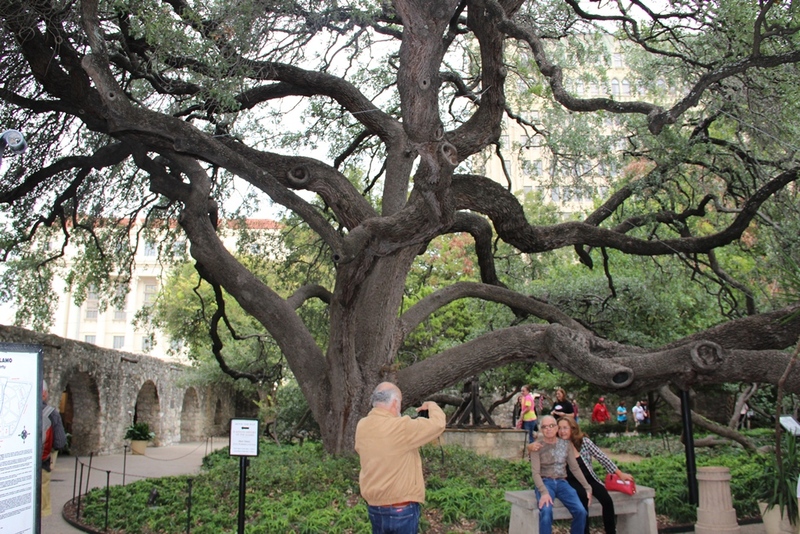 This tree may be the coolest part of the whole place! It’s free to visit, though parking in the area is neither free nor readily available. The environment is an interesting contrast, as on the one hand there are strict rules for treating the area and its facilities as a Shrine. On the other hand, there is quite a commercial and over-developed gift shop, and the line to get in is slowed down by requiring everyone to pose for photos on the way in so that they can offer you a wide range of personalized souvenir options on the way out. Out of respect for the fallen heroes? Although the profits from the gift shop sales help keep it free to visit so it’s not all bad. Perhaps I’m just being cynical, but our visit to the Alamo didn’t exactly move and inspire us. Facilities: lots of facilities for the money, although we didn’t stay long enough to take advantage of most of them. 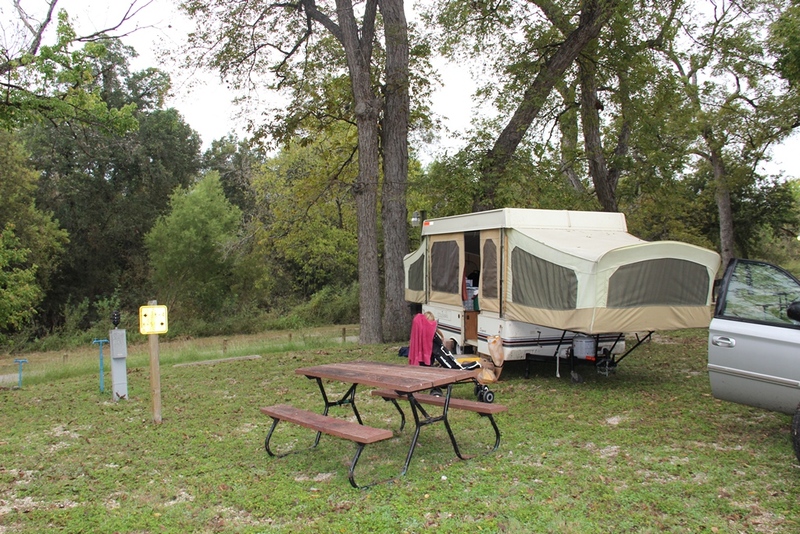 One particularly nice feature is that the campground is adjacent to a paved walking/biking trail the follows a creek. I took a very nice little twilight jog after the kids were asleep. Bathroom facilities were modern and well-maintained. Neighborhood: Lots of kids, including school groups and scout troops at the time we were there. 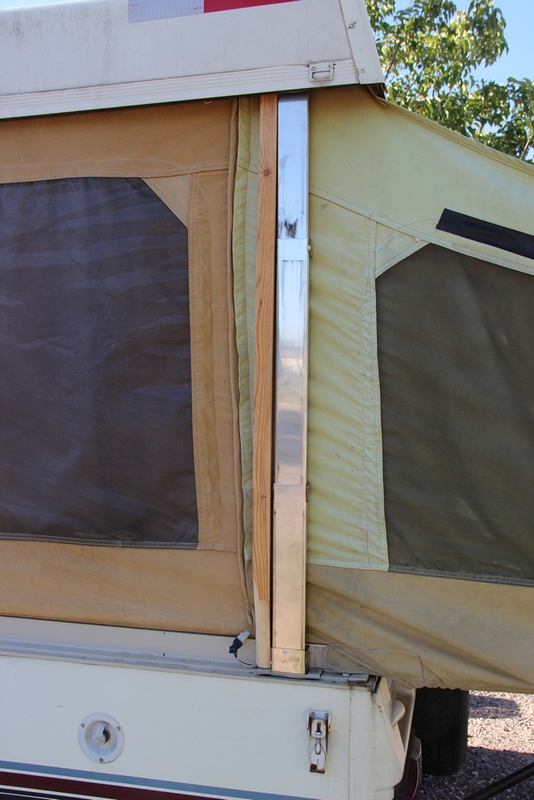 It’s definitely a family-friendly campground. Comments: We were pleasantly surprised by the natural surroundings considering how centrally located it is in a city. Just be aware that all those beautiful trees, grass, and creek areas are also home to quite a number of 6-legged friends, so plan accordingly. Texas is big. That may seem obvious, and we knew that but it wasn’t until we decided to cross it that we understood it from experience. To go from visiting our friends in El Paso to visiting our friends in Houston, given our self-imposed 4 hour per day driving limit, was going to take several days. So why did we stay in Fort Stockton? Well, we looked at our route from El Paso to Houston, then looked at what was about 4 hours away from El Paso along that route. Nothing. Absolutely nothing. So we thought about stretching the day a little longer but there was continued nothingness. Fort Stockton is right along I-10 and is the only dot on Google maps between El Paso and San Antonio. Decision made. 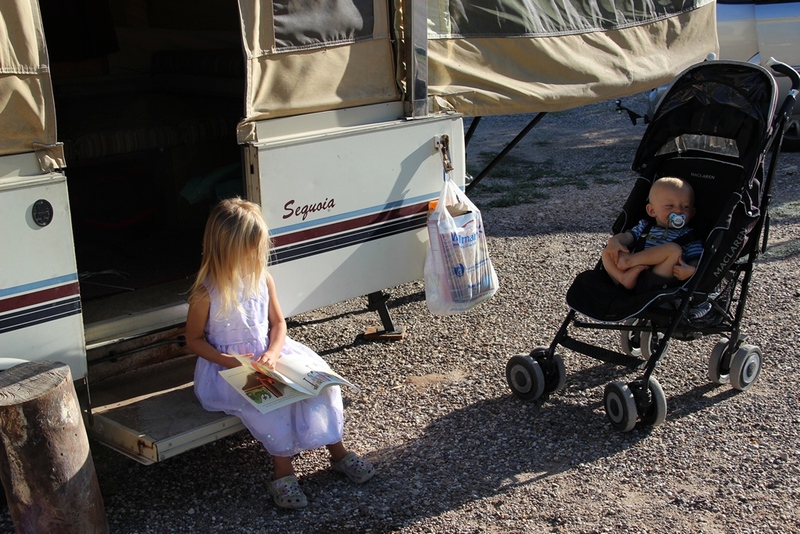 Our stop in Fort Stockton would have been just a campground review (we’ll get to that) if not for a little extra excitement that came as we set up Home Sweet Pop-up for the night. A cable in the mechanism that allows us to raise the roof (and holds it up once we’ve raised it) snapped. One of the corners couldn’t be raised with the hand crank and couldn’t support it’s own weight. Poor Staffan spent the whole evening working on trying to fix it but lacked the proper tools and equipment to do so. Eventually we solved it by Staffan lifting the disabled corner while I cranked up the other 3. When they were at full height, we supported the corner with a 2×2 that Staffan had cut to just the right height. It would get us through a night or two until we could get to Houston, where we could sleep in our friend’s guest room and try to get the pop-up repaired. In the meantime, as Staffan was working hard to make sure we had someplace to sleep, the kids and I ate dinner at the on-site “restaurant”. The food was okay, but the whole place had more of a church fellowship hall kind of ambiance and didn’t feel much like a restaurant. We were thankful for it, though, because we couldn’t cook in the camper while it was being worked on. Our visit to Fort Stockton was thus mostly stressful, but we got to see more of the town than we would have otherwise as we drove around looking for what we needed to fix the camper. Neighborhood: We didn’t see any other families. It doesn’t seem designed for long-term stays, but for most it’s probably a place to stop and sleep on the way to somewhere else. Comments: The office is connected to the restaurant and has strange open times. This was inconvenient for us because we needed local help finding stores to get what we needed, and also because Peter left his favorite car in the restaurant when we ate dinner. 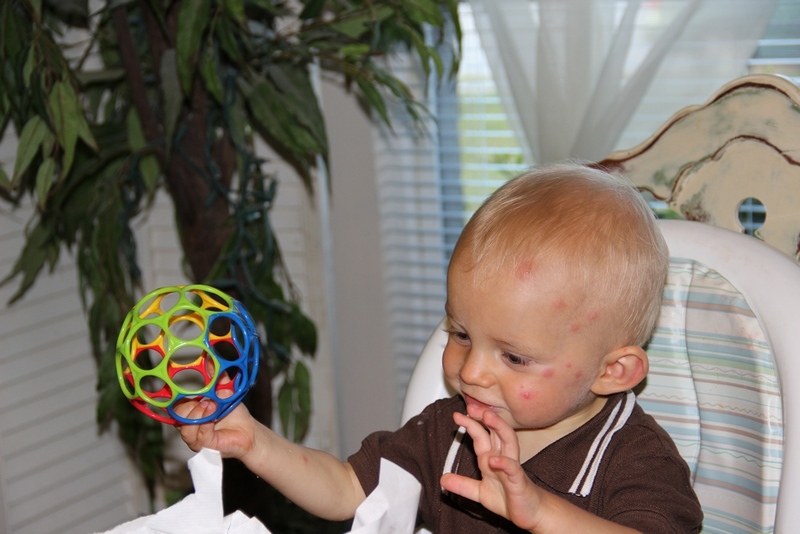 He had just gotten it as a present in El Paso but he loved it. When we missed it, they were already closed for the night, and weren’t open in the morning until almost lunch time. We had lots of desert to cross so waiting wasn’t an option and we were forced to leave it behind. 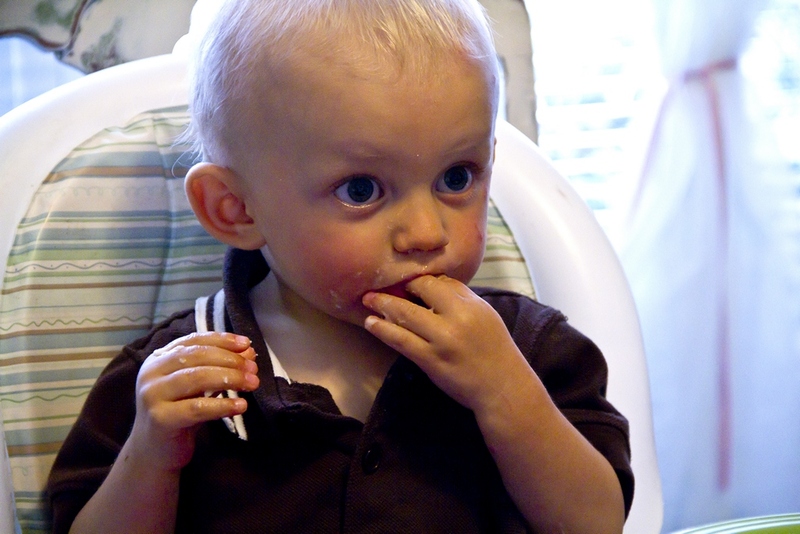 I hope another child got to enjoy it while waiting for his or her dinner! 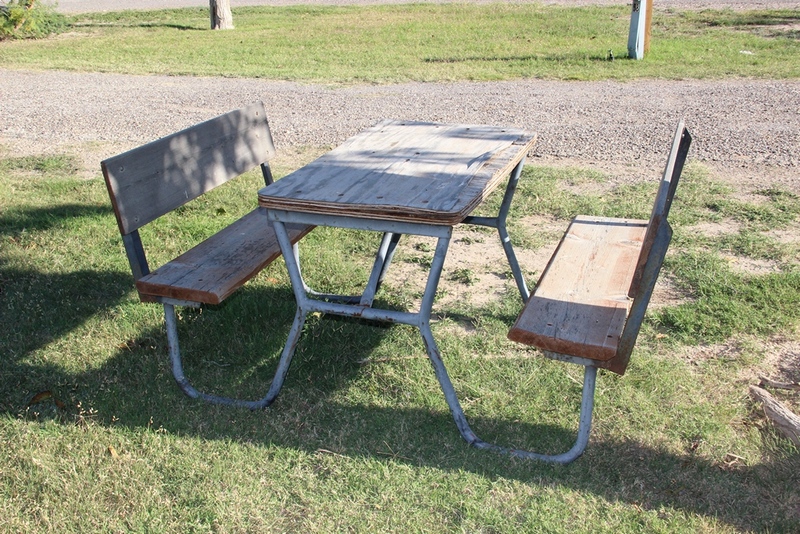 I would not plan to use the picnic tables unless they’ve replaced them. They seem to be made from unfinished plywood, weathered so that the plies are separating, held together but a rusty metal frame. Splinters with a side of tetanus? No thanks. 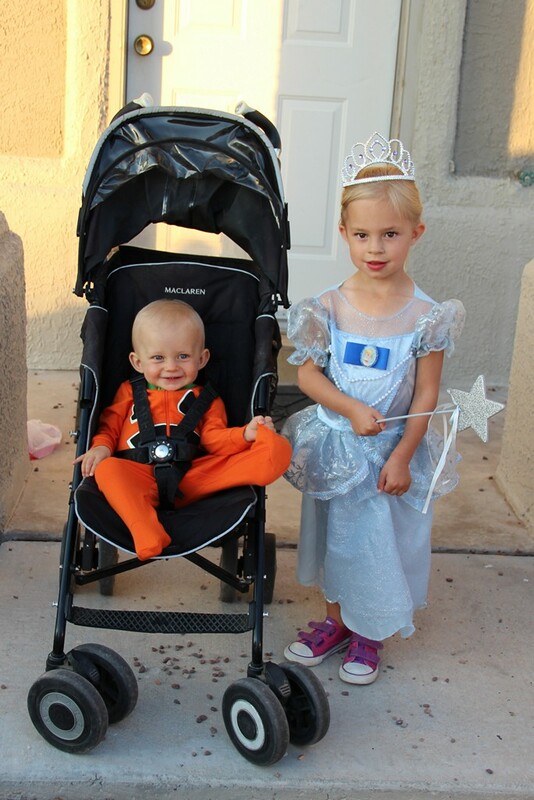 The first real American Halloween for our kids! 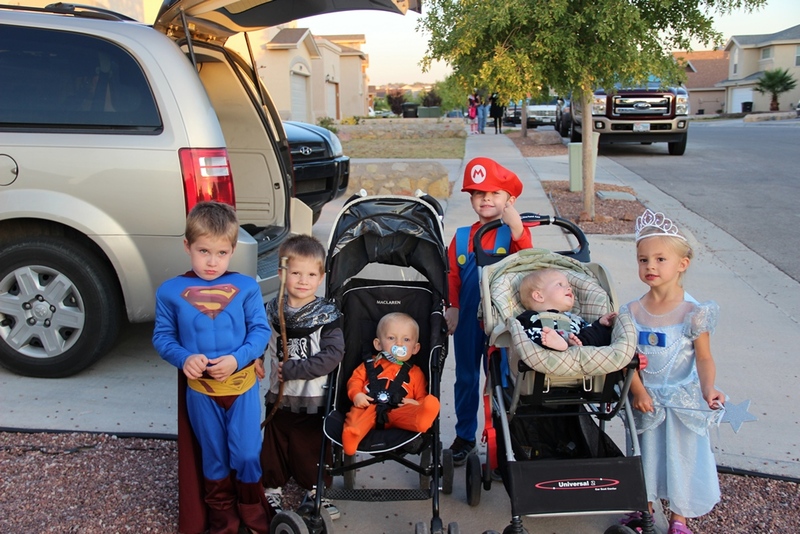 It was such perfect timing that we were staying with our friends, so we were in a family-friendly neighborhood and had another family to go trick-or-treating with! What a fun night! 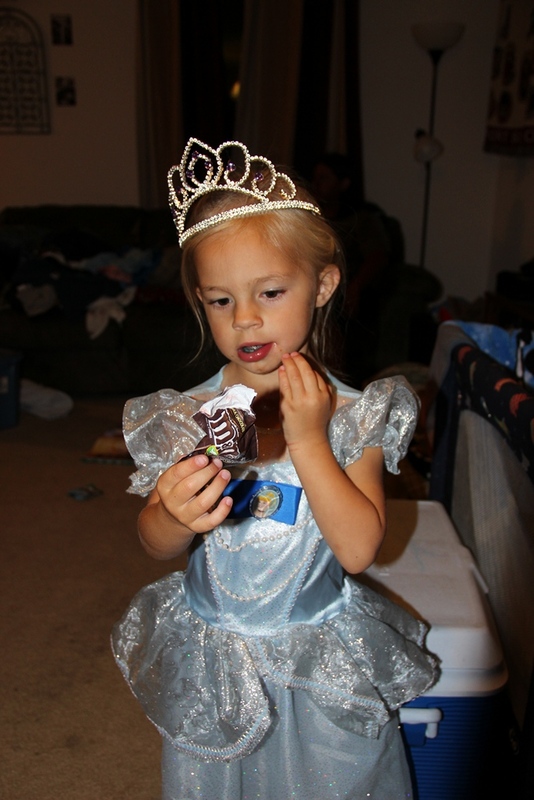 The hardest part for our little princess was deciding which princess costume to choose. No surprise, Cinderella won in the end. Since we correctly assumed that Peter would fall asleep after only a short time, he got to wear adorable pumpkin pajamas for his costume. So we gathered all 6 kids, took some pictures and then we were off. 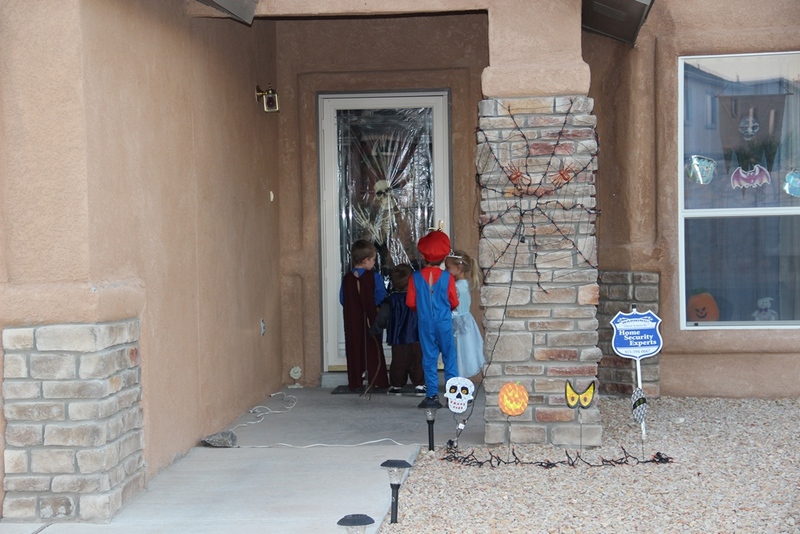 Our rookie trick-or-treaters got a few lessons and tips from the veterans and soon got the hang of ringing the doorbell, saying trick-or-treat, receiving their candy, and (usually) remembering to say thank you. 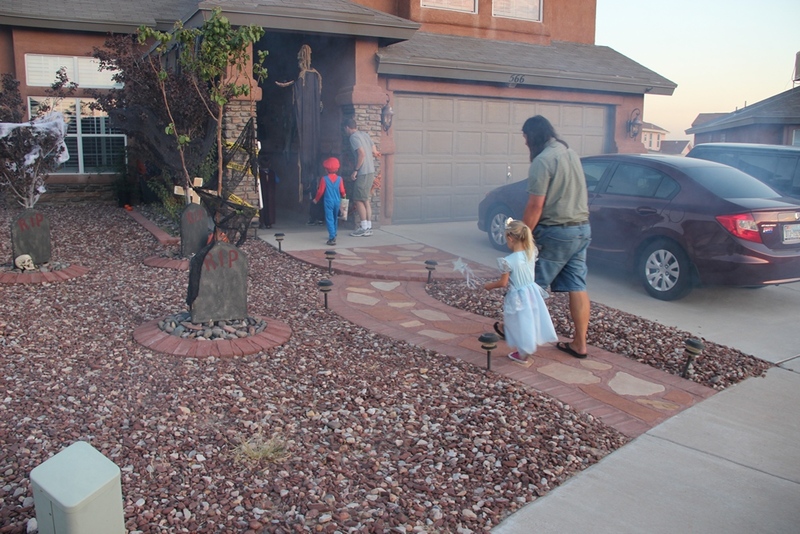 A few houses were a little too well decorated, though, and when there were flashing lights, spooky sounds, or any kind of smoke machine, the candy just didn’t seem worth the risk. “It’s okay, mamma, I already have some candy in my bucket.” On those occasions, the pappas went along for a little extra security. Peter didn’t quite get what all the fuss was about and dozed peacefully in the stroller for much of the evening. When it started to get a little too late, and a little too dark, we went back to the house and helped hand out candy to the older kids who were still out and about. Eventually, Cinderella’s magical night had to end (though thankfully earlier than midnight) and it was off to bed imagining what costume she would choose next Halloween. 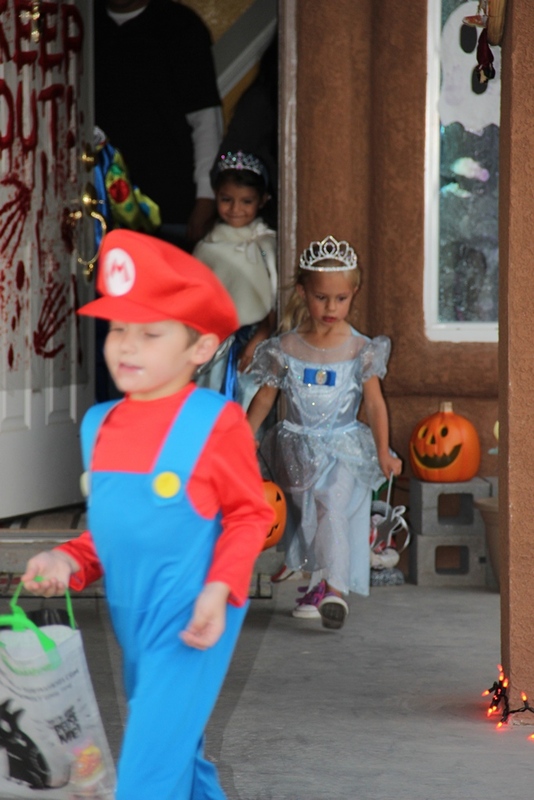 Who knows when the opportunity to go trick-or-treating will come again, but when it does, she’ll be ready. Southbound again to another border town. 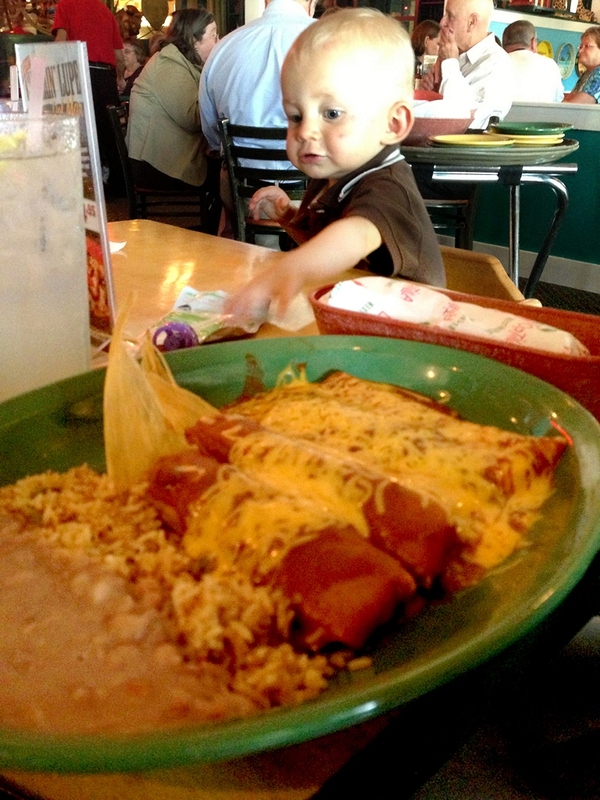 El Paso is very rarely on recommended road trip lists and responses when we included it in our itinerary ranged from confusion to fear for our safety. No one shared tips for things to be sure to see, but we got a few suggestions of places to avoid. Admittedly, El Paso would probably never have made our list if not for a big claim on our hearts: friends. Good friends. The college-roommate-in-each-other’s-weddings-fly-to-Korea-to-visit kind of friends. Through an unfortunate combination of army stationings (probably not a real word) and international missions, we went from sharing a room to rarely living on the same continent for years and years. Our road trip route passing through El Paso was not optional. That being said, I can’t think of a single “sight” we went “seeing” unless you count the fajita drive-thru place or looking out the bedroom window after dark at the lights from Juarez, Mexico. 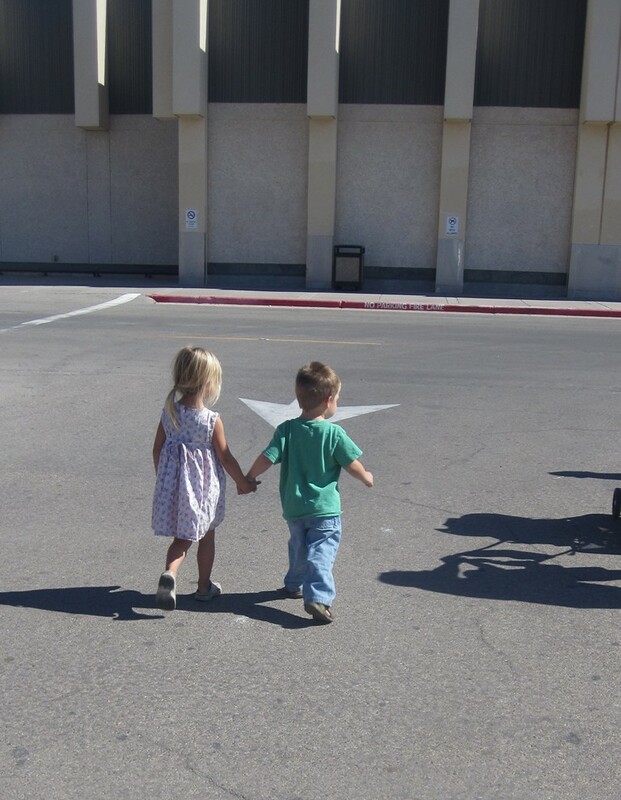 Our visit to El Paso was all about sharing everyday life with our friends for a few days and wishing we could do it more often. I don’t know much about crime statistics or better or worse neighborhoods in El Paso. It was a bit spread out (as cities in Texas seem to be in my limited experience) and required lots of driving, but otherwise we had a very nice stay in El Paso and never felt unsafe in any way. 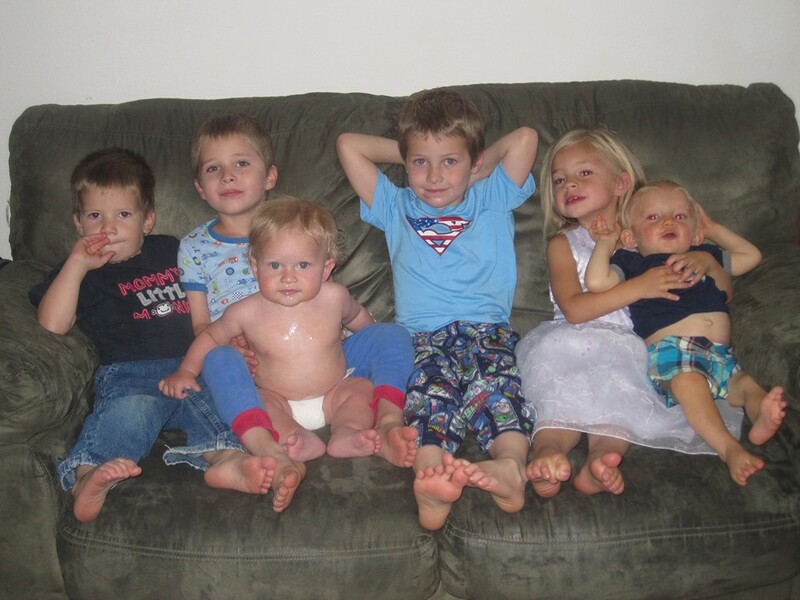 6 kids under 7 all looking at the camera? You’re witnessing a minor miracle friends! 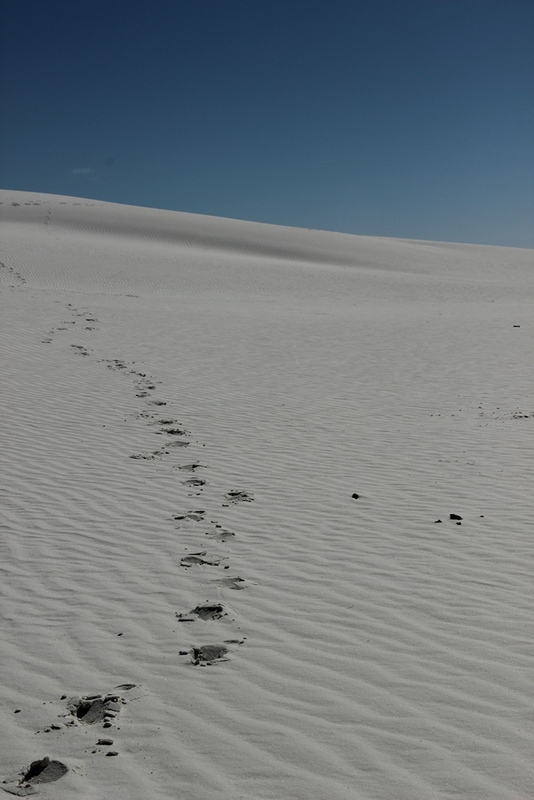 I had never heard of White Sands National Monument before we started planning our trip through New Mexico. Maybe it’s because I’m from the East Coast and I had never heard anyone talking about going there, but this gem of a park was not on our radar until we started looking for a stop-over to break up the trip between Albuquerque and El Paso, TX. Our visit to the park began at the visitor’s center with a short video explaining why the sand is white, the animals that live in this unique environment, and an overall history of the region. Then we headed deeper into the park to experience the phenomenon for ourselves. 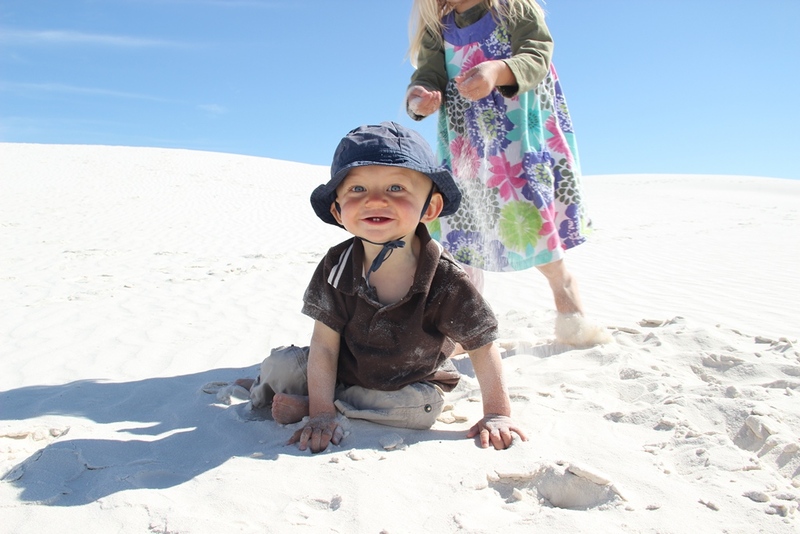 The reflection of the sun off of the white sand is particularly strong, so sun protection is important. We chose one of the many roofed (shaded!) picnic tables to eat our packed lunch, but the kids were too eager to get out on the dunes to eat a whole lot that day. 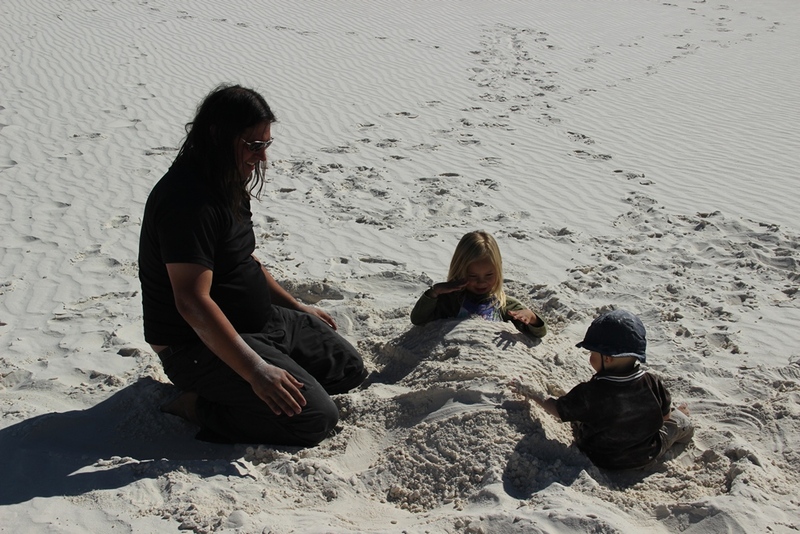 We were staying at a campground in nearby Alamogordo (see campground review below) that had sleds available to borrow for trips to White Sands. 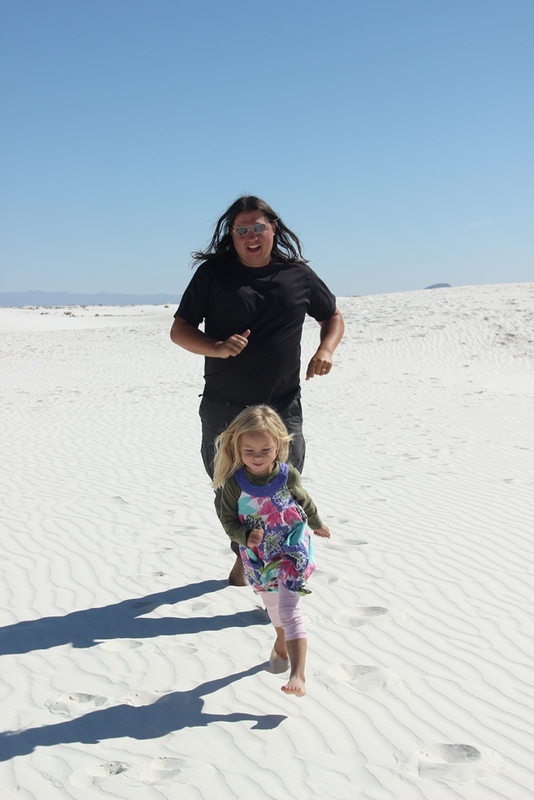 Since we live in a place that generally has about 6-7 months of snow each year, sledding isn’t exactly exotic for us, but it seemed to be the thing to do at White Sands so we gave it a shot. 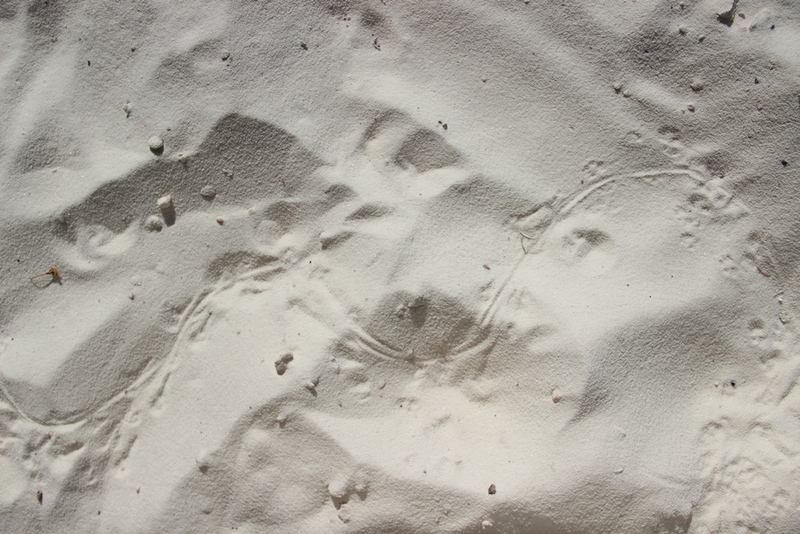 The white gypsum sand has a different texture than the sand we’re used to. It feels more like baby powder or flour. But it isn’t slippery. So while it was exotic to sled down a sand dune, it didn’t go very fast and much of the time we were pushing ourselves down the hill with our feet. Maybe we were doing it wrong? It was fun and we took a bunch of pictures, but we also realized pretty quickly that this was not an all-day activity. So we grabbed the park map and picked a few hiking trails. One was the Dune Life nature trail, a stroller and wheelchair accessible boardwalk with regular placards talking about different aspects of plant and animal life in this unusual habitat. It was a short, easy walk and we learned a lot. But we were also up for more of a challenge. 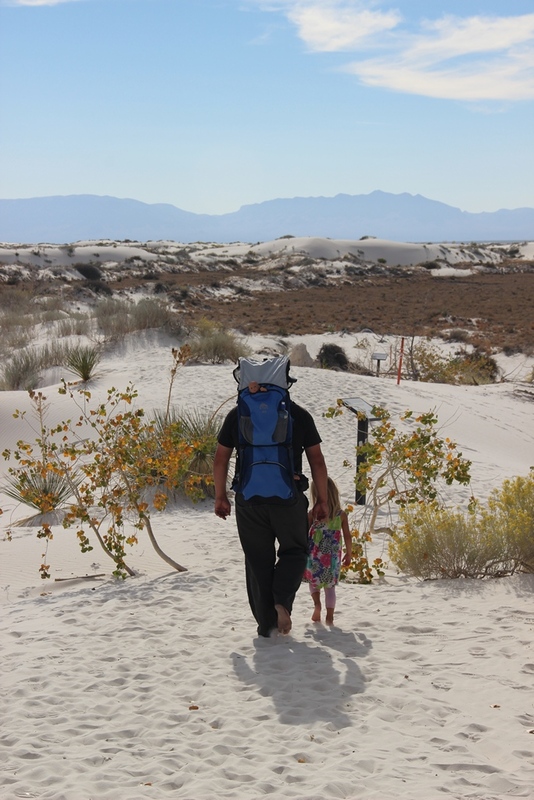 So we drove to another trail head and exchanged the stroller for the backpack carrier. We found a loop trail that went up onto some dune ridges and wound around showing different examples of plant and animal life. We quickly realized that there really isn’t any footwear that is well-suited to such a trail, and it wasn’t long before the whole family was barefoot. Staffan, who generally prefers hiking barefoot anyway, particularly enjoyed this rare occasion when the rest of us also ditched our shoes. 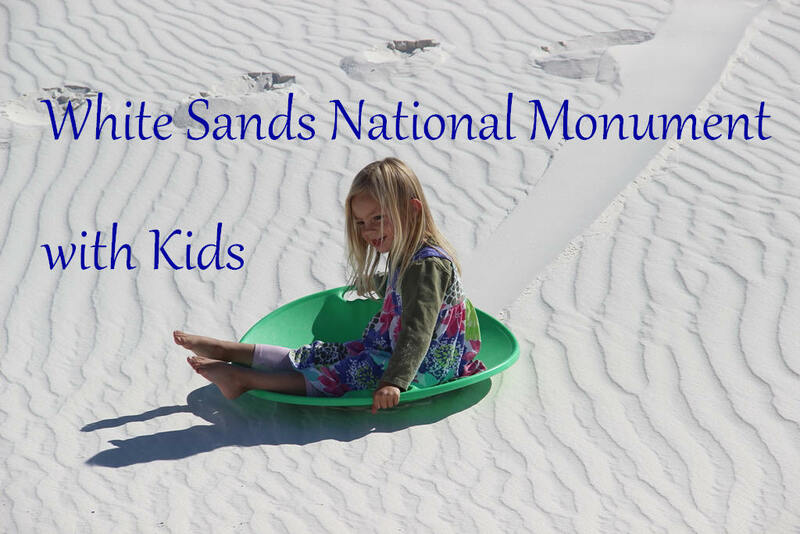 As much as we enjoyed sledding near the picnic area and the boardwalk nature trail, getting away from the road and crossing the dunes with the sand between our toes was definitely the best way to experience the park, in our opinion. It’s not a strenuous hike, but definitely something we’d recommend. The park also offers moonlit hikes and stargazing, and maybe someday we’ll go back with older kids who can stay up a little later to experience that. 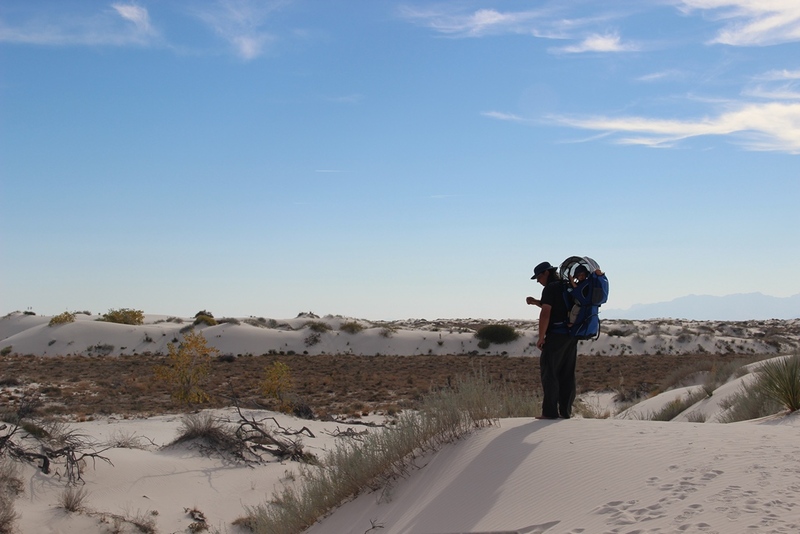 Location: a relatively convenient 15 miles from White Sands National Monument. 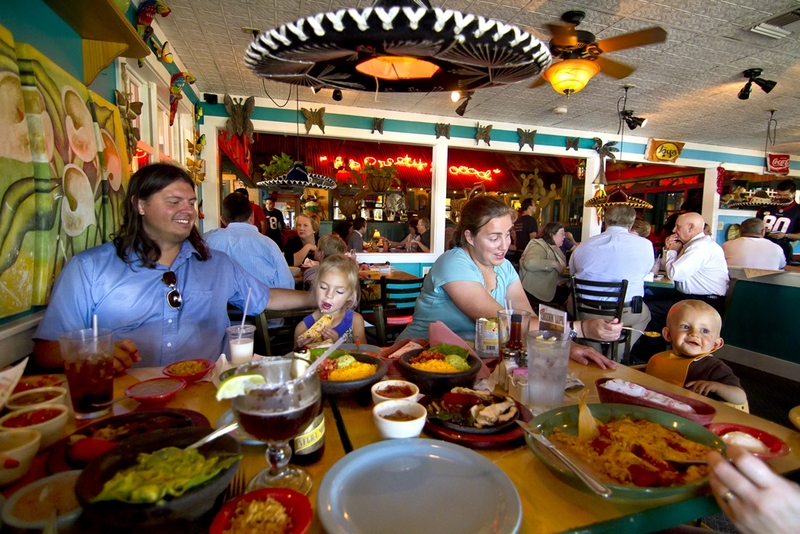 Just a short distance from the main road through Alamogordo, which offers a variety of stores and restaurants. 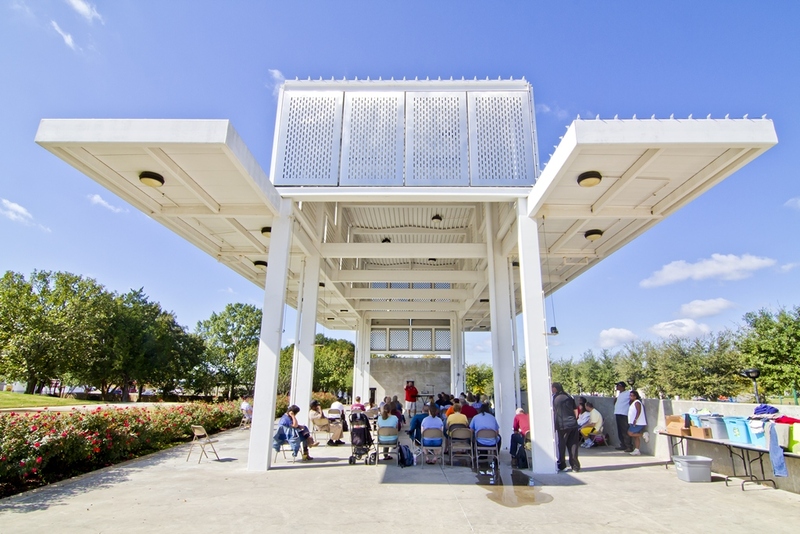 Facilities: sturdy concrete picnic table/benches, a light at each site. Bathroom/shower facilities were clean and reasonable. 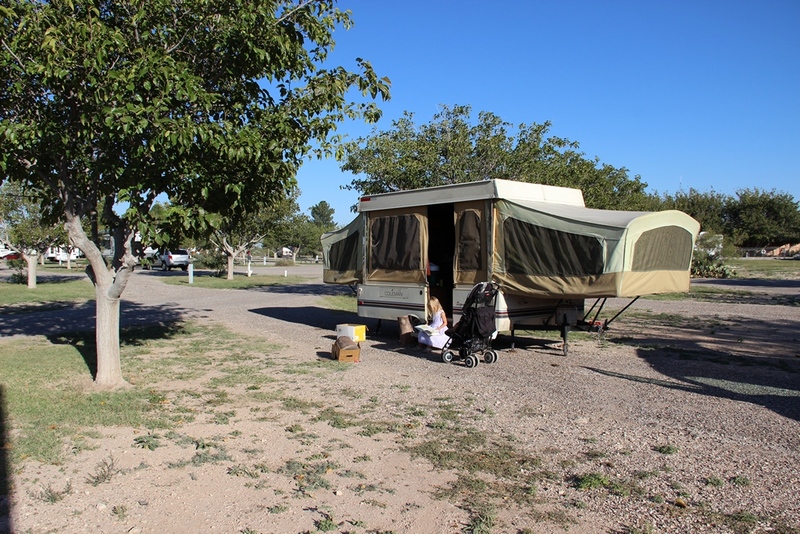 Neighborhood: there seemed to be a number of families that were living there long-term, which is a different environment than an RV park catering to shorter stays. This is probably a lot different now, though, if it’s a KOA. The staff was very friendly and helpful! Comments: The opportunity to borrow sleds for free for our trip to White Sands was very much appreciated! I hope they still offer that! Sorry, we forgot to take a picture of the campsite. 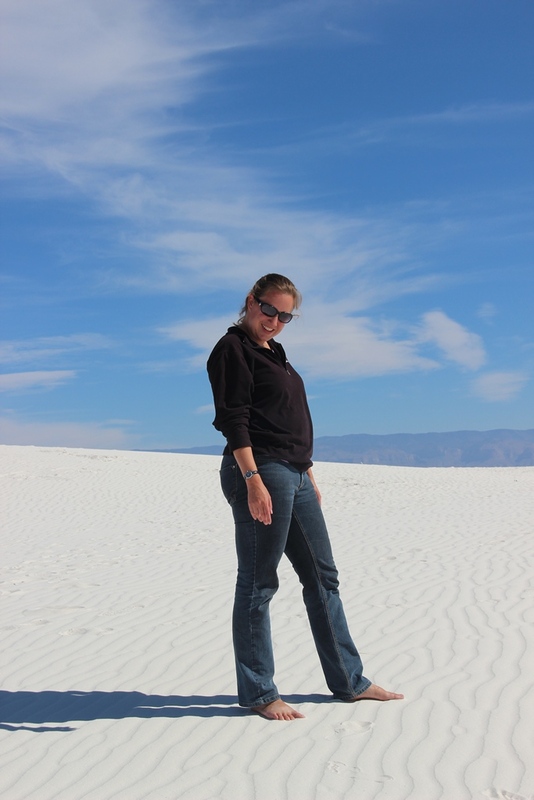 While Hurricane Sandy slammed the East Coast, we were high and dry in the deserts of Arizona and New Mexico. Our media exposure was limited and while we’d heard there was a big “superstorm” back east, it took us a few days before we understood the impact the storm would have on our route. Our plan had been to start heading north just east of New Orleans, visit some friends in Atlanta, spend some time in the Smoky Mountains and then head into West Virginia to visit cousins. Because of a miscommunication, it turned out our friends in Atlanta would be out of town about the time we estimated we’d get there. And then along came Sandy and dumped several feet of mid-October snow on our cousins in West Virginia. Much of the region had no power, a lot of damage from fallen trees, and plenty of work to do. Our cousins sent word that they wouldn’t be able to host us under the circumstances and we began to wonder if we would be able to find any campgrounds or even hotels that were operating normally along the remainder of our route. The wisest decision, all things considered, was to avoid the whole area affected by Sandy as much as possible. We’d stay as far south as possible until we reached the Atlantic coast around Jacksonville, FL before heading north. The new header picture shows our adjusted route. *Note: This post is intended simply as an update to explain our change in plans. We were thankful to be safely out of range of the storm when it hit and to have the opportunity to change our plans to keep our family safe. This was little more than a minor inconvenience for us. Our hearts go out to those who lost loved ones or experienced other significant losses as a result of the storm.